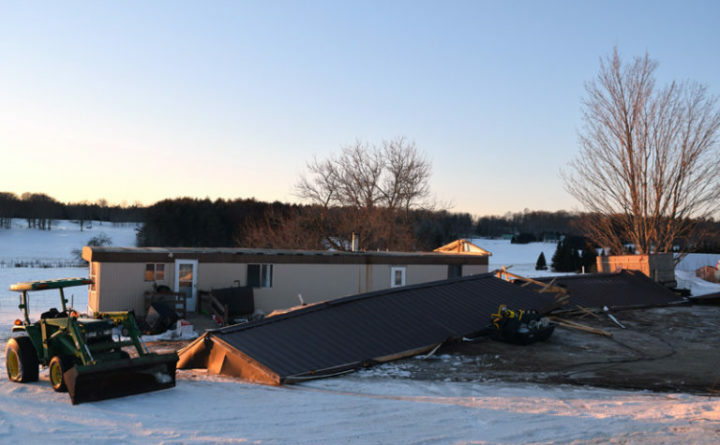 The metal roof of a mobile home at 45 Townhouse Road in Whitefield lies on the ground in front of the home Tuesday, Feb. 26 after blowing off during high winds the previous night. High winds the night of Monday blew the metal roof off a mobile home and onto two cars at 45 Townhouse Road in Whitefield. George Bowden Jr. owns the property, according to town tax records. Whitefield Fire Chief Scott Higgins said three or four people were in the home at the time. No one was hurt. The pitched metal roof had been added to the home, Higgins said, and the original roof remains intact. He did not know the extent of the damage to the cars. The Whitefield Fire Department responded and waited for Central Maine Power Co. to arrive and shut the power off. The incident occurred at about 9:30 p.m.
Higgins said the fire department conducted traffic control because there were pieces of metal flying around. The people in the house stayed somewhere else for the night, Higgins said. Bowden could not be reached for comment.